Mahurangi Actionestablished 1974 as Friends of the Mahurangi, and styled thus at time of submission welcomes this discussion on the Warkworth town centre. The proposed upgrade is a prime opportunity to develop the potential of one of Warkworth’s unique strategic assets—the Mahurangi River—with a cornerstone development at Wharf Street to form the heart of a new riverfront boutique retail precinct. Mahurangi Actionestablished 1974 as Friends of the Mahurangi, and styled thus at time of submission has established a mandate, since its formation in 1974, for participating in processes and projects that have strong links with the Mahurangi harbour and river. Warkworth is of considerable significance to the Mahurangi River, and the river to it. The society’s strategy is to help engender the esteem in which the Mahurangi River is held. Examples of this are the publication of Jade River: A History of the Mahurangi , 2001 and Suggestions for the Mahurangi Riverbank, 1988. Mahurangi Actionestablished 1974 as Friends of the Mahurangi, and styled thus at time of submission generally refrains from commenting on issues and proposals that, while may lie within the hydrological catchment, do not have a clear and direct relevance to the river and harbour. This is a deliberate policy to avoid diluting any hard-won authority the society may accrue. Accordingly, this submission is largely confined to the riverside aspects of the proposed Warkworth town centre upgrade. It is also largely confined to concepts that have been canvassed over the preceding decades. The exception is the suggested extension of Wharf Street. The concept set out here has been canvassed only at the informal Mahurangi Breakfast Club and in the Mahurangi Magazine. The Wilson Cement Works—nationally important industrial heritage site. The river with its indigenous forest backdrop has long been considered inviolate. But the parallel call for the town’s built environment to address the river has lacked a strategy for achieving that goal. Mahurangi Actionestablished 1974 as Friends of the Mahurangi, and styled thus at time of submission first formally presented its Wharf Street concept in 1988. Encouragingly, the council’s proposed town centre upgrade option A includes a river-facing retail precinct. The opportunity, however, is for this to be just the beginning of a new extended Wharf Street running from Wilson Bridge to Lucy Moore Park—a street for people, rather than for cars and parking; a vibrant area, organised so as to be safe even for vulnerable individuals to use. 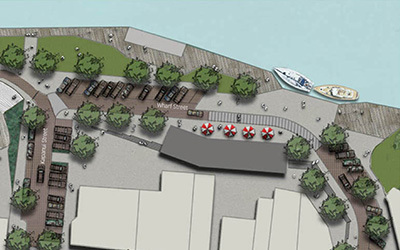 The single-file footpath between Wharf Street and the Wilson Bridge has proved insufficient to convince property holders to form the connections between Queen Street and the river that are ripe for development. And at the Wilson Bridge end, it is somewhat unsavoury. Mahurangi Actionestablished 1974 as Friends of the Mahurangi, and styled thus at time of submission strongly prefers option A to option B. However, it is earnestly hoped that additional options will be developed that could form the genesis of an extended Wharf Street. One option could create a service vehicle only precinct, while another option could permit one-way through traffic, as an interim stage, to be subsequently phased out once the Wharf Street to the Wilson Bridge section was developed. What is decided for Wharf Street will reflect whether the council and community embraces the strategy suggested in this submission—that the key to town reaching its potential is the establishment of a viable river-facing boutique retail pedestrian precinct. Note The riverside precinct need not exclude all vehicles—service vehicles, mobility scooters, bicycles and electric cars and scooters, provided they proceeded at walking pace, might all be tolerated. A number of connections could readily be created, and existing ones enhanced, between Queen Street and the suggested riverside precinct. It is probable that some of these connections could be achieved simply by providing planning assistance to the property holders involved, and by waiving consent fees. The riverside precinct, of course, would not exist in isolation. It would simply form the central business section of the work-in-progress, the Wilson Cement Works walkway. The Wilson Cement Works is Warkworth’s greatest untapped asset. Today it lies just out of sight and mostly out of mind but when it was the town’s main employer, and the Mahurangi River was a busy place, it had a huge presence—albeit a mile downstream. The employees walked that mile to work along the riverbank, the freshwater pipeline between the Elizabeth Street Weir and the works providing a useful footbridge across the several side streams. Mahurangi Actionestablished 1974 as Friends of the Mahurangi, and styled thus at time of submission advocates that this walkway should form the principal visitor access to the Wilson Cement Works. The concept is also strategic to ensuring the viability of a river ferry service. 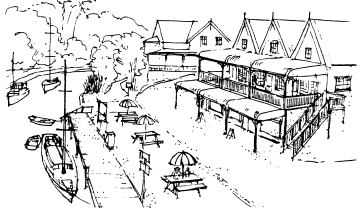 While this is a separate discussion—a joint Warkworth, Wilson Cement Works, Mahurangi Walkway discussion—the suggestion is that having the town serve as the staging point to the Wilson Cement Works would ensure that hungry and thirsty works visitors had every inducement to prolong their stay in the town. The desire for Warkworth to be more accessible to, and accommodating of, visiting boats is unanimous within the community. A number of concepts have been advanced, but sufficient to say here that the Wharf Street option A and this society’s extended Wharf Street concept, better address the function of Warkworth as a boating destination than does option B. Potentially, Wilson Bridge is a fine place from which to enjoy the Mahurangi River. 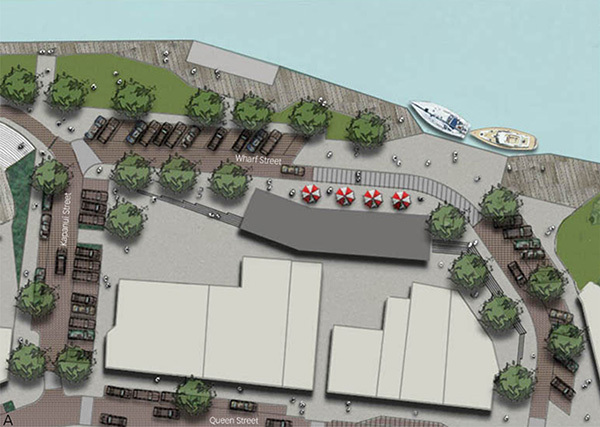 If Wilson Bridge was developed with private investment, along the lines proposed for Wharf Street option A, it would add impetus to connect it to, and have it form part of, the riverside boutique retail precinct. The imperative demanded by the Mahurangi’s elevated sediment accumulation rate is that all riverside and town upgrade construction be of appropriately low impact design. By fully embracing low impact design philosophy, the proposed upgrade can appropriately showcase the council’s commitment to the goals of the Mahurangi Action Plan. Should it be necessary to rebuild Queen Street along the lines in the council’s upgrade concept, Mahurangi Actionestablished 1974 as Friends of the Mahurangi, and styled thus at time of submission would strongly support the incorporation of rain gardens and associated low impact design techniques to reduce stormwater impact on the river. Also importantly, such measures could be used to foster community awareness that the street largely drains into the river. Assuming that fiscal constraints preclude the proposed upgrade occurring during a single financial year, Mahurangi Actionestablished 1974 as Friends of the Mahurangi, and styled thus at time of submission would greatly prefer that the initial stage concentrate on the riverside aspects, and on the connections to the riverside. While this preference is motivated by what the society perceives is best for the river—the best option for engendering respect for the river—it is respectfully suggested that money from the public purse would go much further there, given the private component. Improving how Warkworth looks from the river, and how Warkworth views the river, is good for the Mahurangi.